Complete with break tank. WRAS approved. Constant rinse temperature system gives hygienic sanitised results. Suitable for hospitals, clinics, nurseries, laboratories, etc. 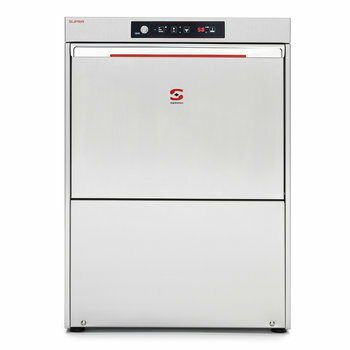 and ideal for glass washing in the hotel & leisure industry. Double skinned construction: thermal and acoustic insulation. 2.5 kW wash tank: optimal recovery time. Its easy-to-use electronic panel is equipped with wash and rinse temperature display. This model includes stainless steel top-of-tank filters. All versions also available in 230V/50Hz/1ph. For washing all types of plates, glasses, cups and cutlery. A constant temperature rinse water system guarantees sterilisation of all ware to NSF specifications. Partial draining and replacement of wash tank water on each cycle, aid self cleaning during use. Rinse boiler temperature adjustment and a thermal cycle delay option, guaranteeing a minimum final rinse temperature of 85ºC for each and every rinse cycle, is incorporated as standard. Double skinned construction and a door with a highly efficient watertight seal, ensures energy saving and acoustic insulation. Safety door micro-switch. Removable stainless steel rack holders ensure even distribution of wash water without dead zones. Precision positioned water jets guarantee optimum washing result for even the most stubbornly stained glasses. Easy to assemble, boltless rinse spray arms. Complete with top-of-tank stainless steel filter set. Automatic detergent and rinse aid dosing equipment. Sammic ware washers are designed for easy and fast on-site maintenance. Cycle duration: 120 " / 150 " / 180 "